The Dark Heart is the final boss in the strike mission, Savathun’s Song. It initially has two phases where the player must shoot out the eye in order to inflict damage. While doing so, players must also defeat the incoming mobs. One player focuses on the mobs. Another player will focus on attacking the Dark Heart whereas one will focus doing both. As a Shrieker-type enemy, it also fires a variety of energy bolts which the player must weave through to defeat it. If you have a team, split up into three roles. One will take on the ads, the other will kill Dark Heart, and the third member will flex with the battle. For taking on the minions, the Titan class may be best due to the barrier it can set up. It can also set up a barrier behind the one attacking the Dark Heart as it can shield from incoming attacks. Keep striking down the Dark Heart until the eye shuts. Once it shuts, the players will find Acolytes and Knights coming in. Take them out before taking out the Dark Heart again. The Dark Heart will then teleport themselves to the opposite end of the balcony with a constant flow of Acolytes. Keep your roles as mentioned in Step 1 and you’ll blaze through this part easily. Once its health drops down however, Ogres will appear. With that, two players will have to use their Supers to immediately defeat them. Letting Ogres walk around and whittling it slowly is dangerous especially for the person focusing on the boss. After that, keep hitting the boss until it reaches ~66% of its health. There, it’ll begin the second phase. This time, the Dark Heart will move to another part of the balcony. A new mechanic appears with a ritual taking place. As the ritual takes place, there are wizards. Two players will take out the wizards while one (the one best with the controls) should go after the Void Charge on the main balcony and leap their way to the upper platform. Once at the top, slot in the charge and the Dark Heart is now vulnerable. Though there are Cursed Thralls running around, you don’t need to focus on them. Focus on trashing the boss. It’s a battle of attrition as you duck, cover, run for your life, all while shooting it. If you can fire your Super then, that’s good too. 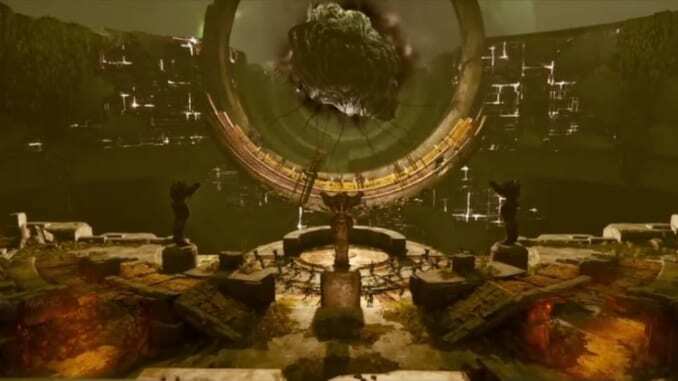 Once it’s down, you’ll have finished your mission in Savathun’s Song.